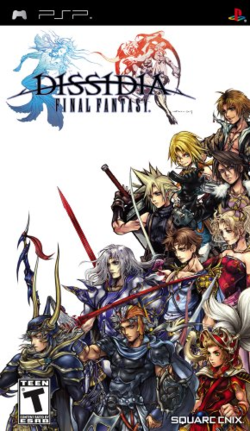 Dissidia: Final Fantasy is an action/fighting game released by Square Enix as part of the commemoration of 20 years of the Final Fantasy series. A 3D fighter, Dissidia puts players in the reins of memorable Final Fantasy characters - a hero and a villain from each of the ten numbered games. According to the storyline, two deities - Cosmos and Chaos, representing harmony and discord respectively, have summoned the characters to do battle. They themselves, however, are being forced to fight by a great dragon known as Shinyru. Tired of the fighting, Cosmos takes matters into her own hands to try and end the conflict. This page was last edited on 30 April 2011, at 08:07.